Last weekend I had originally wanted to go to the Lantern in Festival in Jinju. Unfortunately, my travel partner had to back out because she had a wedding she had to go to instead. Not wanting to make a journey that far and expensive by myself but determined not to spend the weekend doing absolutely nothing, I instead decided to go spend Saturday in Seoul. One of the things I like about living in Jeomchon is that we aren't far from Seoul. Two hours may seems long to some, but the bus ride always go by quickly (especially since the buses are super comfortable and I usually end up sleeping). Seoul is really easy to navigate and full of things to do, and is one of the places I've become quite familiar with these days. I took a 9 AM bus to the Express Bus Terminal in Gangnam. I stopped at the bookstore because I wanted to pick up a few new Korean books to help with my studying. After getting my books and picking up some Starbucks (a given when I'm in the city), I had plans to meet my friend Ji Young in Itaewon. While I was at Starbucks, I checked my phone and saw she left me a message on Kakao. She told me that her dad got two tickets to a concert to see Taeyang, a famous K-pop singer, and wanted to know if I wanted to go with her. I had no idea who he was, but I am never one to turn down a concert. I told her that of course I would go with her, then quickly texted my other friends to see if they knew who this guy is. It turns out just about everyone knows who he is except for me. Taeyang is one of the two very famous leading men from the band Big Bang. Big Bang is one of the most popular K-pop boy bands, and among the members Taeyang is known for his ripped body...and his nice voice too. He's had a very successful solo career, which he is is currently promoting on his Rise tour. 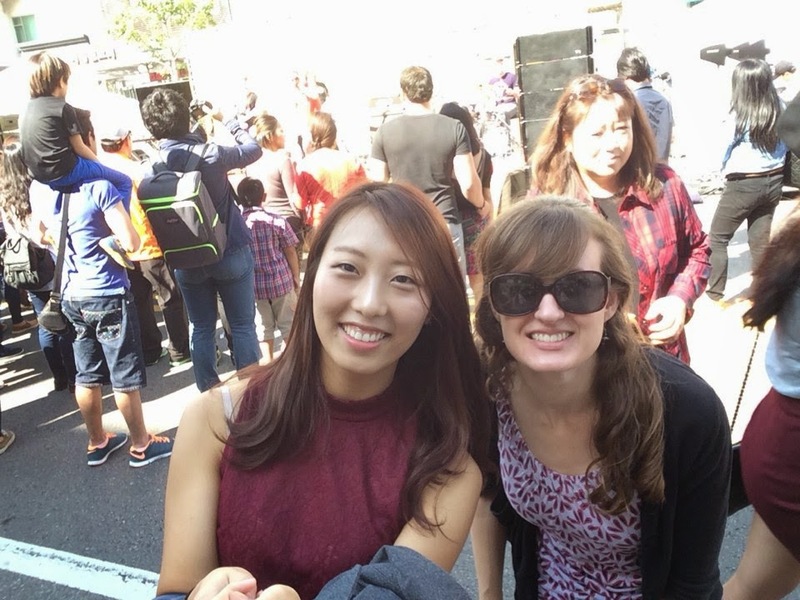 The concert didn't start until 6, so I still met up with Ji Young in Itaewon where we were surprised to see there was a huge international festival going on. There were TONS of people, as well as vendors selling all different kinds of food. We walked around for a bit, then made our way to a Mexican restaurant (another MUST when in the city). It was great to catch up over Mexican food and an afternoon margarita--amazingly it had already been nearly two months since we had seen each other. After we finished lunch we made our way to Olympic Park, where the concert was being held. There were naturally already tons of people lining up, but I was surprised to learn that even though we were in the standing room section, we still had numbers on our tickets. Turns out that we had to line up in order according to our tickets before entering the concert. The whole process was super orderly, as things generally tend to be in Korea. The show had an early stat time--around 6:00. There was no opener, and I was a bit surprised to see how small the venue was. When I think of K-pop concerts I expect them to be held in super huge arenas, packed with fans. This wasn't really the case. The venue location itself was pretty small, and there were some empty seats. 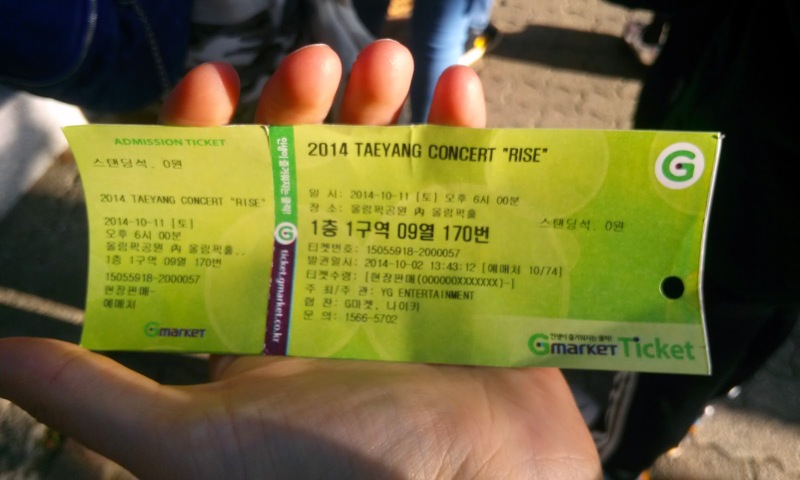 However, I should mention that when Taeyang came out Korea's pushing and shoving reached a new level of craziness. I've been to a lot of concerts in my life, but I've definitely never been pushed like I was by these aggressive teenagers. The show itself was pretty much what I expected from a K-pop concert. Taeyang spent the majority of the show with his shirt off (which I totally didn't mind), but when he was wearing clothes he was dressed in quite the flashy ensembles. There was dancing, complete with backup dancing girls wearing very little clothing, a section of the show where Taeyang serenaded a member of the audience on stage, a number of costume changes (unfortunately we weren't allowed to take photos), and a bunch of screaming teenage girls. Needless to say, we had a great time. Ji Young and I left the show during the last song to try to beat the crowd a bit. It was a good thing we did because there was a a League of Legends world championship going on, which had a crazy number of teenage boys leaving at the same time as us. We got on the subway to get our distance from the concert craziness, then found a place to get some dinner. Dalkgalbi is just the best!! After we finished dinner, it was already time to get back to the bus station. As much as I love being in Seoul, I wanted to sleep in my own bed and have all of Sunday at my own place. I took the last bus from Seoul to Jeomchon at 11:00, and was back in Jeomchon around 1 AM. Overall, I'm really glad I made the decision to get out of Jeomchon for the day. It would have been easy to just sleep and watch tv all day, but instead the day turned into an adventure I never could have predicted when I woke up in the morning. 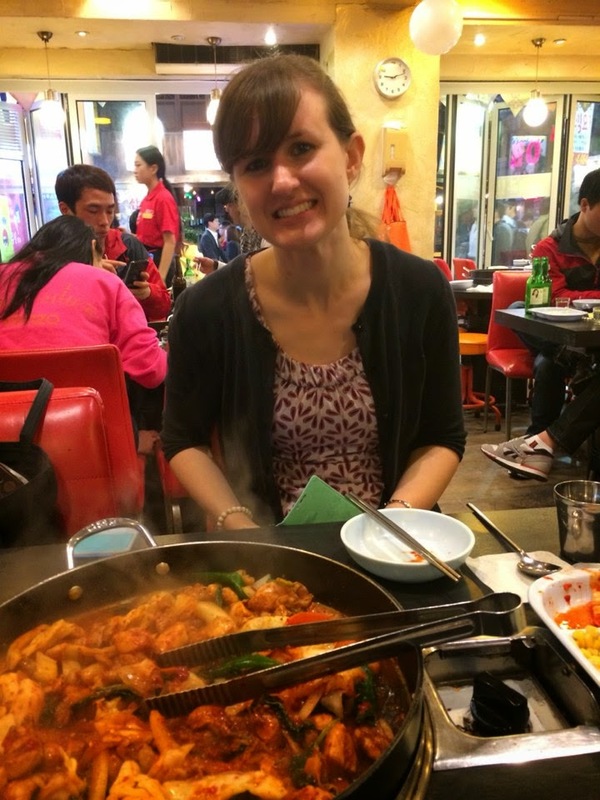 I originally was really disappointed I couldn't go to the lantern festival in Jinju, but instead I ended up checking off something I also really wanted to do in Korea. 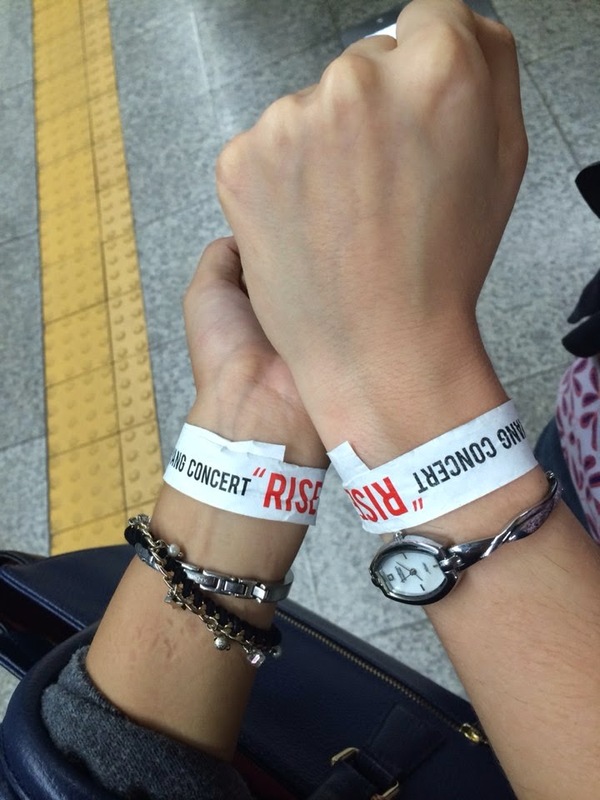 It's usually really difficult and expensive to get tickets to K-pop concerts, so it was something I didn't think I would feasibly be able to experience in Korea. However, sometimes things just fall into place and take you for surprise--days like these remind me of how much I love the opportunities, freedom, and friendships I have in Korea.